Birthday parties – loved by kids everywhere, but too often dreaded by parents. I happen to love throwing birthday parties but will admit to abhorring the cleanup that comes after the kiddos all go home. Wouldn’t it be great if there was a place your family could have a birthday party and not have to clean up, manage the details, or provide entertainment? Thankfully, there is such a place. 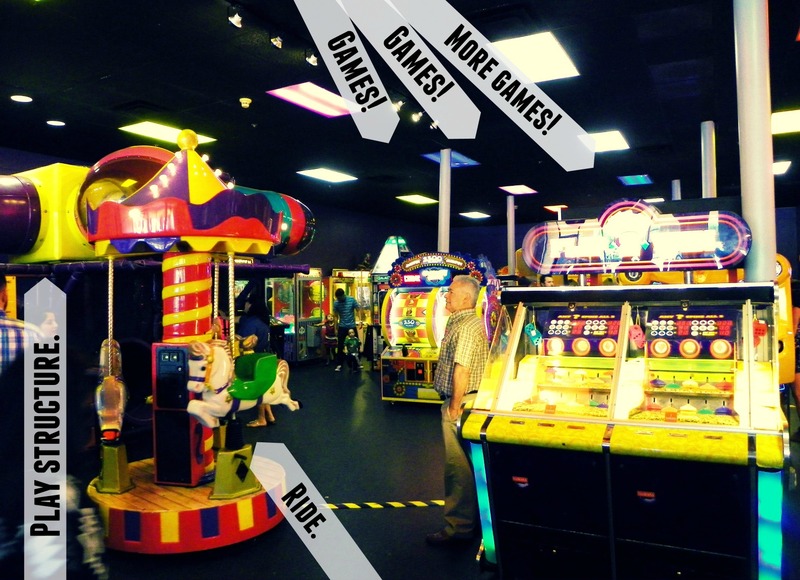 Peter Piper Pizza has two party packages that are sure to please, great pizza, a ton of games, ice cream, and no cleanup. Each of Peter Piper Pizza’s packages include tokens for the kiddos. Tokens are like magic to kids because they can be turned into pure fun or even tickets. These same tickets can often be seen dragging behind excited kiddos as they run to show their haul to their parents and friends. At our last party, we had a few very large piles of tickets going on. It was quite exciting. Peter Piper Pizza has electronic ticket counters that make it easier to keep those piles under control. 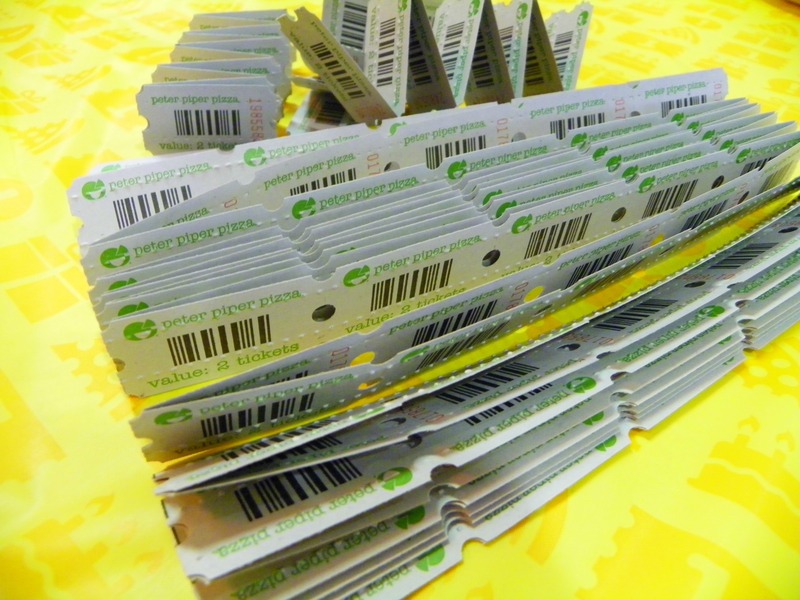 Simply feed the tickets into the feeder and then take the receipt which shows the ticket count (so much easier to manage than enormous piles of tickets). 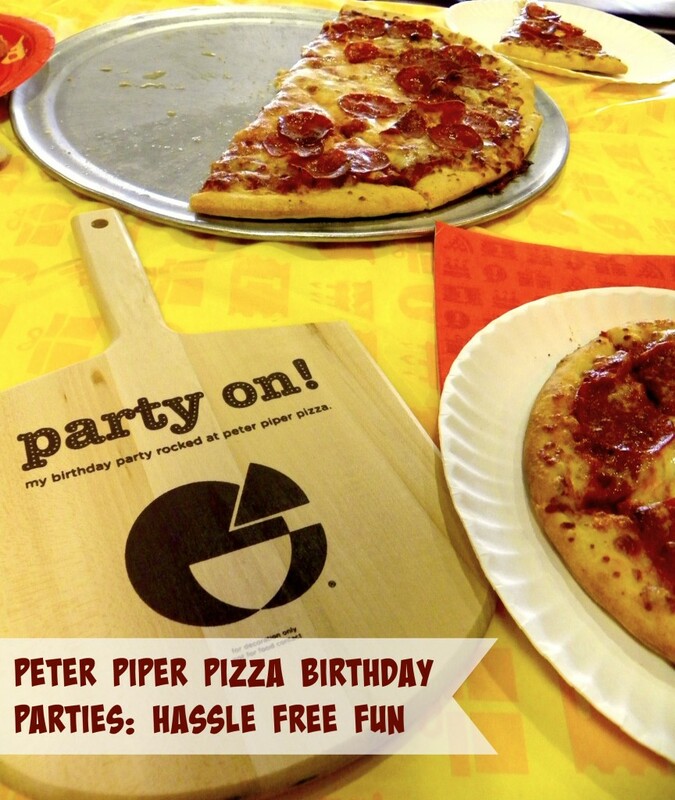 Peter Piper Pizza birthday packages include a Build-Your-Own Pizza experience for the birthday child. Here is my cousin’s pizza creation. He had fun building his own pizza which, of course, was extra delicious because he made it. Kids love to make their own pizzas. After eating delicious pizza, the token and ticket experience kept going until the tokens were exhausted and the tickets were all counted. My son and the birthday boy both spent their considerably high ticket load at the prize center, where they pondered important questions like “candy or toys?” They had some pretty neat items in the prize center. I even saw a puzzle block that was like a Rubix cube with pictures on it. One of the best parts of the Peter Piper Pizza experience is the Personal Party Host that is included. Our host was named Charles and he was amazing and attentive. He made sure the drinks were refilled, the pizza was served, the candles were lit, the cake was properly cut and served, and that everyone was having fun. Did I mention cake? Yes, because unlike many places, Peter Piper Pizza lets you bring in your own cake. That is so important to so many families. You can bring in the cake and they will provide the knife and even help you serve it. 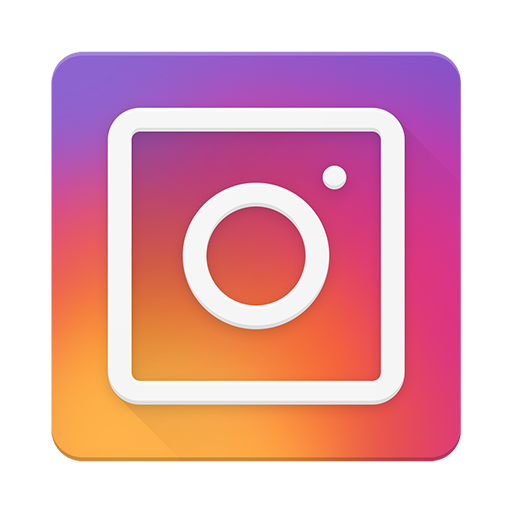 Additionally, both party packages include Peter Piper Pizza party invitations (paper or electronic), reserved and decorated tables, including place settings and a personalized mylar balloon. That is right, they set up and clean up. We love Peter Piper Pizza birthday parties, and they are a sure hit with the kiddos. Call or go online and book yours today. Also, please remember to tip your party host! Those people are hard workers! Disclaimer: I hosted a complimentary party at Peter Piper Pizza to facilitate this review. All opinions are my own. This looks like such a fun place for a birthday party! That is a great deal for sure.My kids love having parties at places like this! That looks like a fun place, I bet kids really have a blast there. The prices actually look pretty reasonable. Sounds like a great time! I always preferred to go out for a party – it eliminates the cleanup! Parties like this were always my kids favorites to go to and to have! This is a great deal for a kids birthday party especially since it eliminates prep and cleanup! I love reading these articles because they’re short but invomratife. Oh Em Gee, this dude is hot… Slightly grossed out/amazed by the staph, but he’s seriously Tom Welling’s twin or something (Tom Welling was superman in the “Smallville” tv series). I would totally have this guy’s babies, and I’ve only ever thought of adopting.